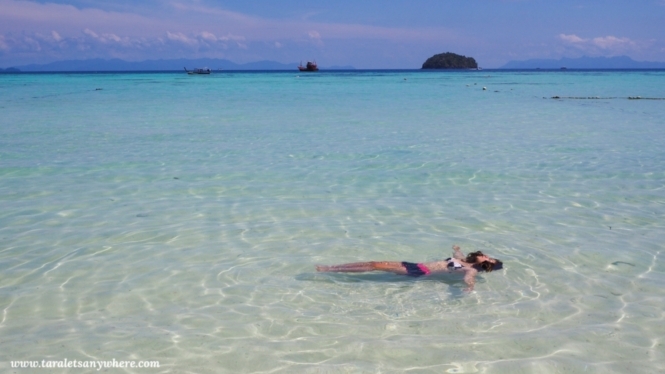 Southeast Asia is home to some of the world’s best beaches, there’s no question about it. One of the downsides though is that you’re vacationing with a thousand other tourists (sometimes more), and sometimes that can spoil the experience. Indeed, finding a quiet spot to set up your hammock can be quite a challenge particularly during the high-peak season, and so here we’ve gathered a best-of list of the best beaches in Southeast Asia during summer where you’re guaranteed escape from the tourist crowd. We’d been to Tikling Island twice now, and for those two summers we were able to frolic in this beach to our hearts’ content without the distraction of the usual throng of vacationers. Even today, it’s a great wonder why it isn’t as famous as other islands in the Bicol province, considering that it has gorgeous pinkish-sand beach with blue water… not to mention the fact that the island hopping tour around this area is superb. There are no commercial establishments here, and so the choice of staying overnight is by camping tents. Tikling Island is easily reachable from Manila. Just commute via bus to Matnog, Sorsogon, and head to the pier to rent a boat to take you to the islands. You can read more about our visit in Tikling Island here and our re-visit to Tikling Island a year later. Carabao Island (or Isla de Carabao) is a little-known island just an hour away from its popular counterpart, Boracay. Carabao Island is relatively quieter, perhaps due to lack of tourist activities and night life, as well as scarce commercial development in the area. As such, it attracts mainly those who want a great beach minus the party scene. To get to Carabao Island, ride a ferry from Caticlan Port or hire a private boat from Boracay Island. You can read more about Carabao Island here. Balabac is starting to make a name for itself, but safe to say it’s still one of the few places where you can have a quiet and memorable beach vacation (for now). 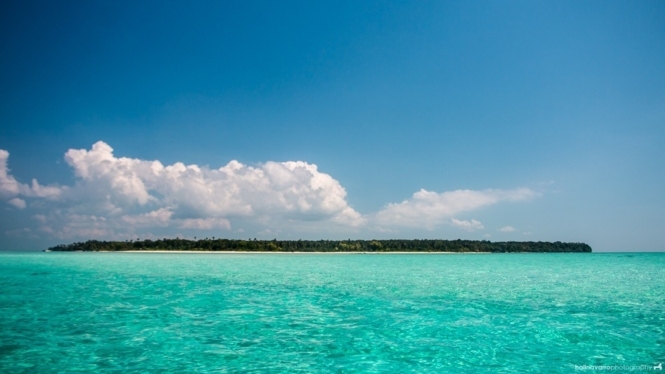 There are several islands in Balabac you can visit, so you can either stay in one or island hop for several days. There’s the famous Onuk Island, the white-sand Punta Sebaring, the starfish-filled Candaraman Island and another one with a long sand bar. Balabac is located at the southern tip of Palawan province. 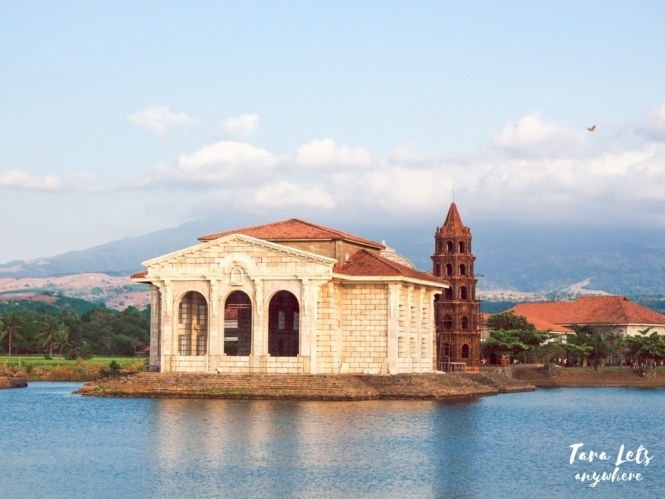 It can be reached by 1.5 day’s travel from the airport in Puerto Princesa. You can read about this travel guide in Balabac and island hopping in Balabac here. When it comes to beaches, the Philippines has it all. But besides those already known in Boracay, El Nido or Coron, there is one as beautiful as it is unknown. It’s the Long Beach or White Beach, the longest beach in the Philippines, with over 14 kilometers of shoreline. Wow, right? Being located in San Vicente, a still unpopular destination in Palawan, you surely have the chance that when you visit the White Beach to have it all to yourself. That’s because only very few tourists have heard about it. The landscape on White Beach looks like a fairytale. The beach has fine white sand and is surrounded by a dense palm tree forest, and the waves are just perfect for swimming or snorkeling. Everything here is still very natural and not at all touristy, so now is the ideal time to visit it. Getting to White Beach is quite easy, considering that San Vicente is situated about halfway between Puerto Princesa and El Nido, 3-4 hours distance from both of these two. Just rent a scooter or get on a bus and you’re there. Calayan Island is what others would say “a little too out of the way”, but it’s a great destination to visit if you’re into untouched beaches. 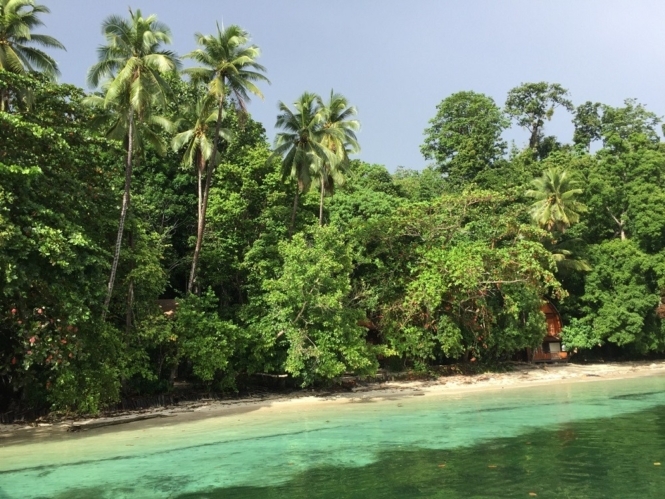 Here you can find the very beautiful Sibang Cove (or Cibang Cove), a long stretch of beach with emerald-green water and consistently strong waves. There are few accommodations in Calayan Island, so you can either go to a homestay or resort or pack a tent in Sibang Cove. Calayan Island is part of Babuyan group of islands, in Cagayan province. The best way to get to Calayan Island is to get a private ride up to the port of Aparri or Claveria and then get on the morning ferry to the island. You can read more about Sibang Cove in Calayan Island and see more photos of Calayan here. 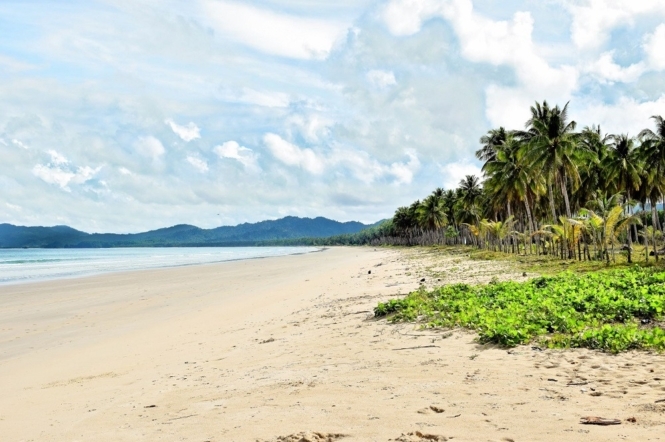 Dawei is the perfect jumping off point to beaches in the south of Myanmar. I took daytrips from Dawei on a rented scooter with the help of offline maps (Maps Me or Google). Some beaches were used by fishermen for launching boats or storing crab traps. Most require passing through a village off paved roads, and sometimes on slippery, sandy paths. My favorite was this secluded beach, Pa Nyit. There’s a nearby temple, and a group of kids were walking home in the late afternoon sunlight adding to the charm of the place. You can read more about Dawei from Longest Bus Rides. Raja Ampat is an archipelago comprising more than 1500 small and four major islands situated in West Papua, Indonesia, and is one of those very rare places in the world that is almost impossible to believe really exist. The Raja Ampat Islands are relatively unspoiled, a far cry from big cities, crowds, pollution and mass tourism. It possesses extraordinary natural beauty with crystal clear water, rich marine life, lush vegetation and exotic fauna, making the area perfect for general unwinding, going on photographic safaris, bird watching, swimming, snorkeling and diving. In fact, Raja Ampat is renowned as one of the best places for diving in the world. I totally fell in love with Raja Ampat during my visit in February 2017 and it immediately became one of my favorite places in the world. The beaches are deserted and have unparalleled crystal clear light green water. The islands are doted with islets of different shapes and elevation covered with lush vegetation that look so exotic and miles away from reality. To get to Raja Ampat, there are basically only two ways by plane, from Manado to Waisai, the capital city of Raja Ampat, or by ferry from Sorong to Waisai. From there you need to take a boat to one of the small islands. You can read more about Raja Ampat from 7 Continents 1 Passport. 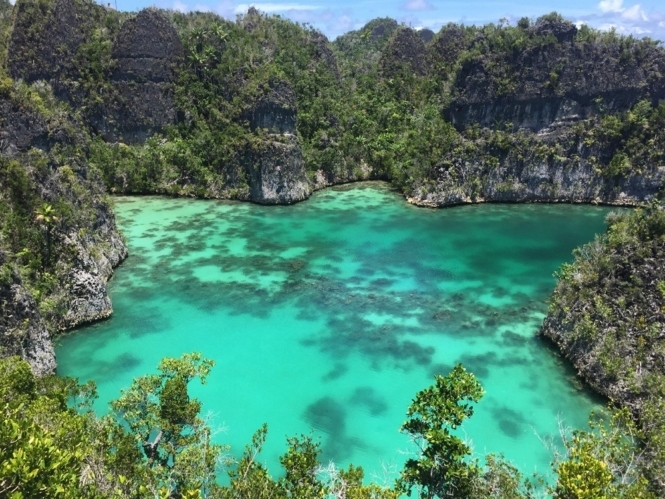 If you’re looking for an off-the-beaten-path island, then search no more – Raja Ampat’s Gam Island is the perfect candidate. Raja Ampat is probably one of Asia’s best-kept gem; it’s Indonesia’s archipelago that boasts with the fame of having one of world’s most amazing marine biodiversity. And the best part about it is that it’s so remote that you have high chances of being all by yourself on a beach. Describing Raja Ampat is difficult. I would say it’s the perfect paradise, although I know it sounds cliché. But if you want to find a serene place, I would recommend to look no more and book your next flight towards Raja Ampat. We were picked up from Waisai by our homestay host. And we are used to staying in very basic homestays, but this one was unbelievable as it was a small hut on a perfectly white beach. There were days when we were the only ones on the beach. So we got to enjoy the healthy coral reef in front of the homestay all by ourselves. 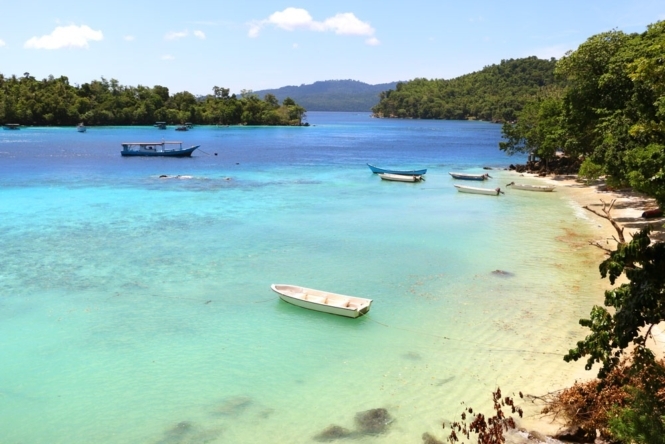 To reach to Gam Island, you will first need to get to West Papua’s city of Sorong. There are flights to Sorong from Makassar, on the Sulawesi Island. From there, you will have to take a ferry to Raja Ampat’s capital, Waisai. And no, you have still not arrived at your destination. You will need to grab another small boat to reach the lush Gam Island. You can read more about Gam Island from Our World to Wander. Most of Bali’s beaches, especially the ones in the south, are unfortunately quite overrun by tourists from all around the world. 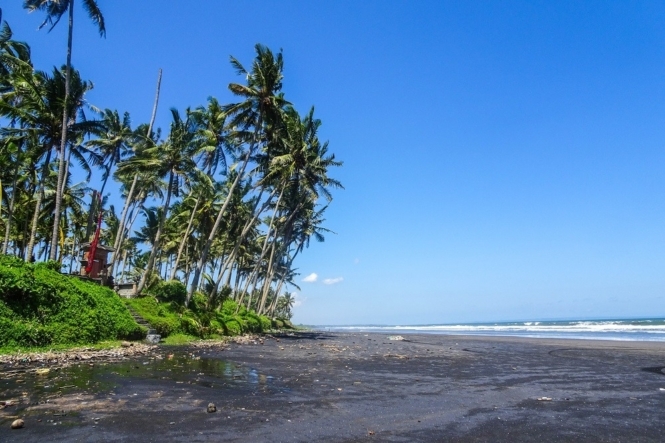 However, there are still a few hidden gems like the beautiful black sand beach of Pasut, just an hour up the coast from Seminyak and easy to reach by scooter. I arrived in the early afternoon and was very surprised that I had the wide and long beach completely to myself! The black sand looks beautiful and the palm trees in the back make it a perfect picture opportunity. After going for a swim, you can enjoy a drink and relax at the pool of the Amarta Beach Resorts, which was the only touristic facility I’ve seen on the beach. When you’re walking up the beach a little bit further, you’ll find some big rocks and one even has a small cave inside. Pasut Beach is also a great place to watch these beautiful Bali sunsets! Make sure to visit this beautiful beach, before the crowds discover it. It’s not difficult to feel slightly claustrophobic when visiting Bali’s southern beaches. Padang Padang comes to mind. But if you’re willing to do a little traveling, you can end up in some of the most beautiful, pristine white sand beaches that the Island of the Gods has to offer. One of these is Nyang Nyang (or Nunggalan) beach in Pecatu and very close to the ultra-luxe Bulgari Resort. Unlike the mostly flat southeastern part of the island, the southwestern side, where Nyang Nyang is located, is quite hilly with jagged limestone cliffs protruding over the ocean. There are two major aspects that make this beach quiet and offbeat. The first is that the ocean is rougher here. So while you can dip in the water, there isn’t much room for surfing or deep-water swimming unless the swell is lower. The other factor is that it’s down a steep cliff, where beach goers will have to take a roughly 30-minute trek to reach the shores. But it’s totally worth the trip. 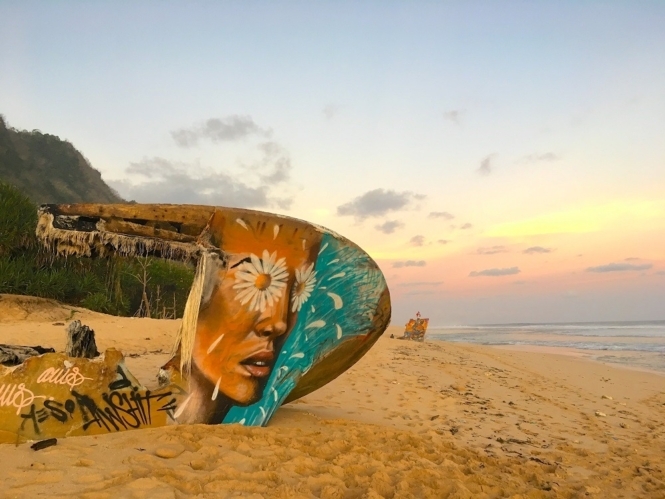 On the eastern side of the 1.5km stretch, you’ll find a few vendors selling snacks and locals posing in front of the graffitied shipwreck. But the most popular activity here for die-hard adventurers is camping overnight in isolation under the stars. I would suggest going before sunset and hiking back up just after as the view is stunning and the sun is not so harsh. Try going after a trip to Uluwatu temple, which is about half a km away. There is parking available at the start of the descent at Plenilunio Villa. You can read more about Nyang Nyang Beach from Singapore n Beyond. Pulau Weh on the west end of Sumatra is one of the few off-the-beaten-track beach destinations in Indonesia. The island is beautiful — a combination of lush jungle, sandy beaches and clear water. 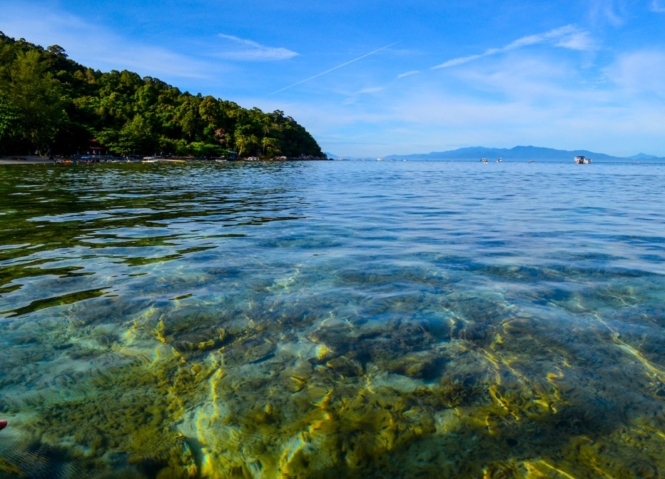 There are several beaches on Pulau Weh. They are not very big, but rather small and usually empty. 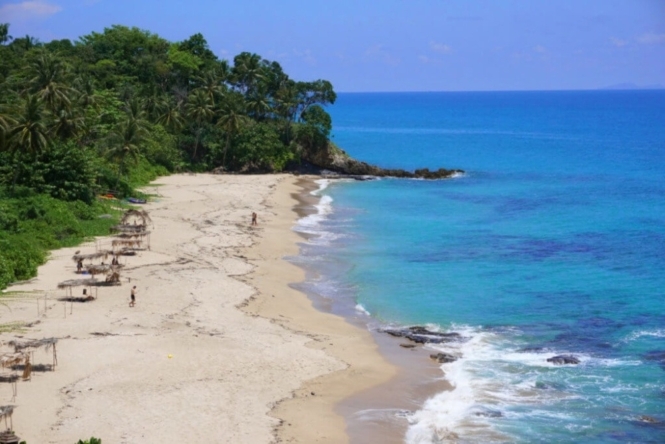 Our favorites are Cabang and Iboih beaches, both are nice for swimming. The island is great for snorkeling and diving; water is warm and clean, coral reef is all around the island to see it you can swim from the beach. There are several accommodation options for different budgets, from cheap local home stays to fancy cabins. There are no big resorts or hotels on Pulau Weh, the island has more of a local feeling than many other beach destinations in Southeast Asia. The best way of getting here is to fly to Banda Aceh, the nearest airport. From there, take a taxi to get to the port and then a ferry to Pulau Weh. You can read more about Pulau Weh from Stingy Nomads. 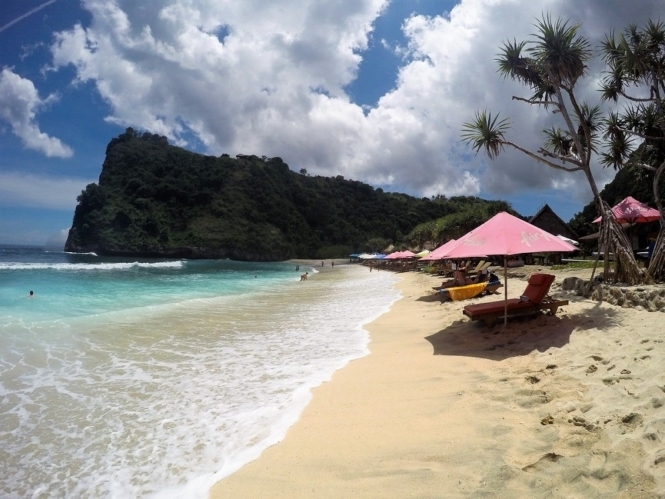 Atuh Beach is snuggled in the east coast of Nusa Penida in Indonesia. The fact that it takes 5 mins of hiking down a steep, rugged staircase to reach the beach adds to its off beat factor, making it inaccessible for few. Nusa Penida in itself is still not very commercial so if you are looking for untouched beauty, this is the island to visit. Nusa Penida can be reached by boat from Bali’s Sanur beach. However, arriving at Atuh can be a mini-feat. Driving around Nusa Penida can be a bit tricky for new riders and navigation is tough with broken 3G networks. Still, you can smile and ask locals or save an offline map to arrive in this pretty paradise. Once you are there, you will have the beach almost all to yourself. You can read more about Atuh Beach from Wander with Jo. 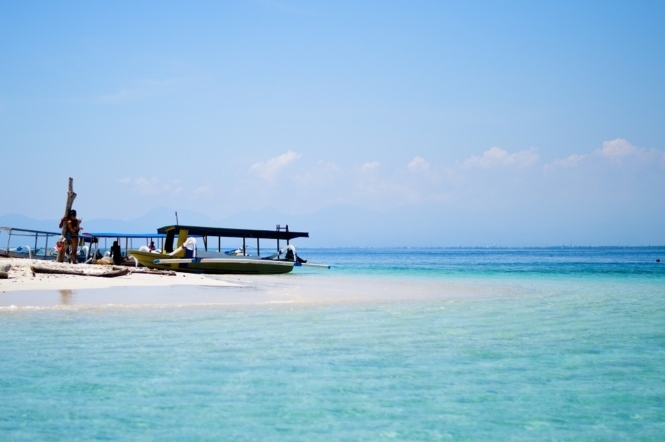 A fantastic little beach can be found on Gili Nanggu in Lombok, Indonesia. This would have to be one of the most beautiful, clearest beach I have ever swam in, not to mention the fantastic snorkeling. This place is absolute paradise and the water surrounding Gili Nanggu is so clear you can see your feet even when the water is up to your shoulders. The sand is so soft, the water so warm and the fish are colorful and friendly! We were absolutely surrounded by fish keen to come and say hi. Seriously, it was like swimming in an aquarium. There is only one place small place to stay on the island, so you don’t have to worry about it being overcrowded. To reach the island you can join a day trip or may favorite way is to make your own way to the Tawun Harbor and hire a fisherman with a boat for the day. It’s then only a quick ride out to the Gili Nanggu. As you start to come into the shores of Gili Nanggu, you’ll notice that the ocean starts getting clearer and clearer and you can literally see the ocean floor. You can read more about Lombok and Gili Nanggu from Thrifty Family Travels. 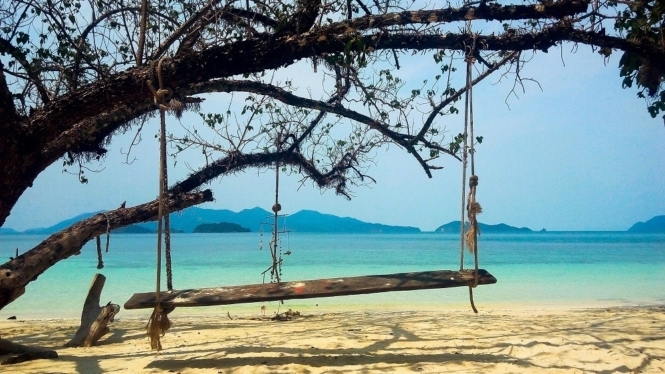 If you’re looking for a relatively pristine island in Thailand, look no further than Koh Lipe. This small island is located at the south and is also called the “Maldives of Thailand.” Summer is peak season in Koh Lipe, but the amount of tourists is moderate at best and you can still enjoy quiet afternoons in one of its three beaches, particularly in Sunset Beach. 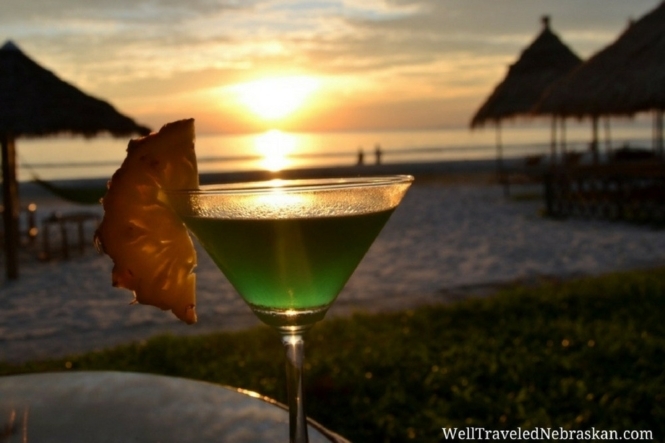 Just lay down a towel on the sand while sipping from a cool glass of fresh fruit juice. You can also choose to island hop in nearby islands. Koh Lipe is accessible from various islands in Thailand or via Langkawi in Malaysia on a limited time during its high-peak season around December. You can read more about Koh Lipe here. Khao Lak offers beautiful white sandy beaches that stretches out for many kilometers and is the setting for many beachside resorts in the area. If you want to escape the crowded beaches of Phuket, then Khao Lak is a perfect alternative option with less crowds and a relaxing atmosphere with many beach bars, restaurants, tour agencies and beachside massage parlors situated close by. The most popular beaches in Khao Lak, among many others, are the Pak Wip beach, Sunset beach and the Khuk Khak beach, with most beaches offering peaceful surrounding and a gorgeous sunset over the Andaman Sea. Evening times on a clear day will be a treat. Getting to Khao Lak is no issue at all, being only an hour drive from Phuket International Airport. You can either hire a personal driver or catch a bus to Khao Lak town center, with most top resorts offering transfers to and from the airport. 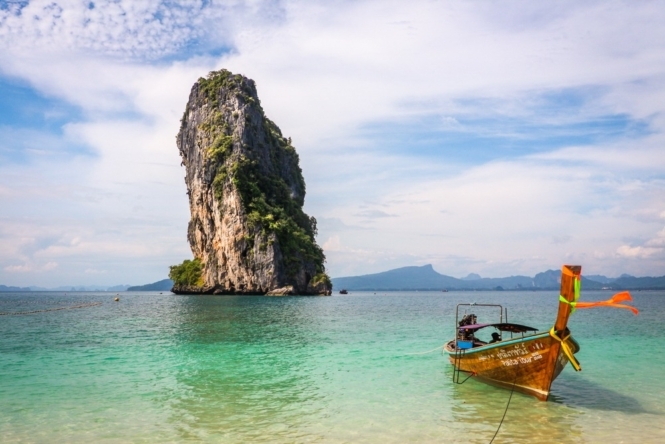 Just 7 kilometers from Ao Nang, the island of Koh Poda boasts a beautiful white sand beach with an imposing karst rock formation off the shore. Many travelers favor a trip to Railay beach when in the Krabi area, but we found it to be severely overcrowded and a bit of a let down. In contrast, the beach at Koh Poda is an escape from the crowds, with enticing turquoise waters just waiting for you to dive in! Although Koh Poda is a stop on the 4-island tours running from Ao Nang, it’s easy to avoid visiting at the same time. Most tours stop here for lunch, so you’re best to visit in the morning or after lunchtime, as it’s a lot quieter. By renting a private boat with other travelers you can determine what time you visit – with a boat from Ao Nang costing 1700 baht for up to 6 people. There is a 400 baht fee for visiting Koh Poda, but it’s well worth it to enjoy the island’s gorgeous beach. You can read more about Ao Nang and Koh Poda from Something of Freedom. One of the largest and less-visited Thai islands, Koh Lanta is worth the several-hour journey from more popular hots pots like Phuket and Krabi. Once there, you’ll be treated to chill vibes and kilometers of incredible beaches. Though you may be tempted to never leave the enormous beaches near the island’s populated north, if you hire a scooter and strap in for a 45 minute ride the island’s south side, you’ll be rewarded with several smaller pristine beaches that remain virtually untouched. One of the best beaches is Nui Beach (also called Diamond Cliff beach), a short stretch of gorgeous wild sand that just barely keeps the lush jungle from spilling into the pristine blue sea. You won’t find a pile of lounge chairs or an army of souvenir hawkers here: just warm sands and a few small makeshift palapas for hiding out from the sun. Even on a busy day, you’re unlikely to find more than a handful of other sunseekers sharing this strip of paradise with you! And if you need a break from the hot Thai sun, drive back up the northern cliffside, where you’ll find a restaurant offering cold ones and some incredible views of the beach below. Whether you’re a family looking for a quiet place to let the kids roam free, a couple looking for a romantic spot to re-connect or a solo traveler searching for quality “me time,” you’re sure to love this amazing beach! You can read more about Nui Beach from Travel Lemming. As one of the lesser known islands in Thailand, Koh Wai has some of the most beautiful, quiet and peaceful beaches of Southeast Asia. 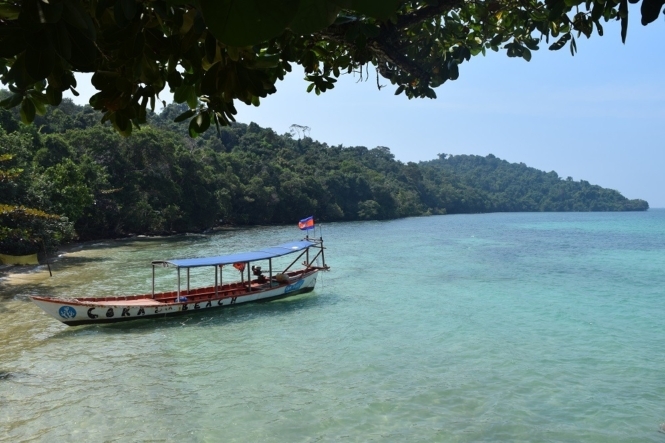 The island can be reached via a boat ride from the more popular and significantly more crowded Koh Chang, from Bang Bao harbor. Koh Wai knows no traffic and noise. There’s only one tiny dirt path that goes around the island, connecting the two beaches. A few bungalows are rented to tourists. There’s no real village — just a couple of restaurants, which are the only places to get wifi. The beaches are beautiful and hardly get crowded. Imagine incredibly fine white sand against a backdrop of palm trees and the clearest, most turquoise waters in the front. Snorkeling is fabulous: there’s a lot of fish, the marine life is thriving. There’s no reliable electricity on the island and a bit less comforts – the other side of the coin means less tourists, no partying, and the chance to relax completely. In choosing a place to say on Koh Samui, we wanted a swimmable, kid-friendly beach, away from the backpacking and party scenes of Thailand. 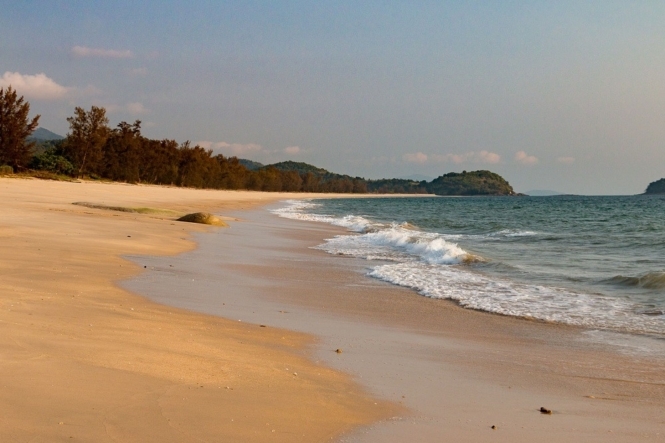 Choeng Mon Beach is the quintessential horseshoe-shaped beach for a tropical getaway. 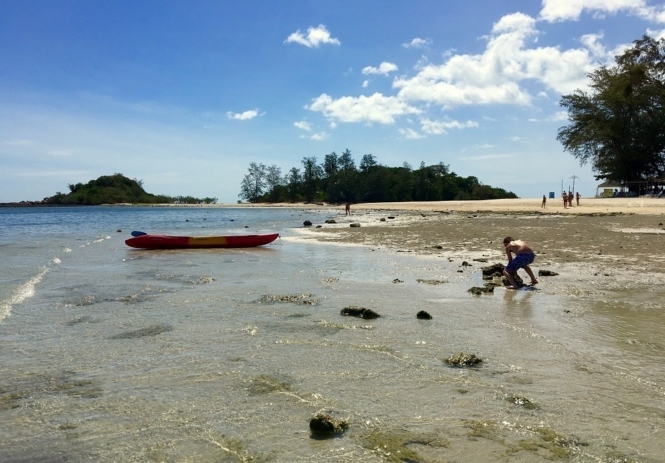 Less crowded and tranquil, Choeng Mon is perfect for families with young and older children as the waters are shallow, warm and there are plenty of tide pools to hunt for sea creatures. Bathtub-warm waters will keep them in all day. Locals sell sliced mango and corn and vend ice cream to cool you off. At thatched huts along the beach, $8.00USD will get you an hour-long massage. Put toes in sand and watch the sunset while eating dinner at Honey Seafood. A short strip of restaurants also lines the road. Walk over in flip-flops for seafood at Garland Samui or surprisingly authentic Indian at Akbar. Take a day trip to see the Angthom Marine Park or the coral and fish-filled shores of Koh Tao. The easiest, most convenient way to get to Koh Samui is flying Bangkok Airways direct out of Bangkok. The flight is a bit over an hour. Other possibilities are a bus or train from Bangkok to Surat Thani and catch a ferry to the island. However more economical, it will take an entire vacation day, and a bit exhausting. Kapas Island, known locally as Pulau Kapas, is a small island in the east coast of Malaysia. It’s one of the beaches accessible from the province of Kuala Terengganu. Its name translates to “cotton island”, in reference to its white-sand beaches. There are several main beaches in Kapas Island, connected through bridges. There are mid-range resorts and accommodations, as well as backpacker options (dorms and camping tents). Finding a restaurant is not a problem as well, as you can find several eateries offering local meals and even fresh seafood (such as fresh water lobster). There is no known peak season in Kapas Island, so unless it’s a long weekend in the local calendar, you’re guaranteed quiet time for chilling in the beach. You can read more about Kapas Island here. The Perhentian Islands are found in the relatively undeveloped east coast of Malaysia, which can be accessed by buses (or flights) from Kuala Lumpur or Penang. However, with only around 20 hotels/resorts on the islands, they are relatively expensive, so we felt we paid well over the odds when we put into a rather ordinary resort (The Perhentian Island Resort), having arrived to Kuala Besut to find only one room left in all the islands (book in advance). Walking from our beachfront bungalow and 20 meters into the sea, we are already surrounded by some of the most abundant coral reef and marine life I’ve ever seen (I have snorkeled tens of times in Southeast Asia). And while I might normally spot 10 or so species of fish elsewhere, on our first swim from the beach we counted 10, 20, 30, including clownfish, a ray and a stonefish. We lost count. Separated by a safety rope from our hotel is then the location of the sea turtle tour, so we didn’t even need to go anywhere. The resort itself is found on a thin slice of beach, surrounded by dense jungle, where we were awakened the first morning by patters on the roof, to find a family of silvered-leaf langurs eating through the branches of the mango trees above. Not to mention the tropical birds hopping between jungle canopy, the friendly squirrels and an antisocial slow loris. I’ve honestly never felt closer to nature before. You can read more about Perhentian Islands from Live Less Ordinary. Palau Besar or big island sits off the East Coast of Malaysia in the South China Sea. To explore and stay on this island it’s an easy speed boat ride from the harbor town of Mersing. Within 20 minutes you have left the town and arrived on a beach with while sand, clear water and palm trees. Snorkeling can be done around the various islands in the region and swimming in the warm waters is a must with kids. We stayed at a nice resort and enjoyed a weekend with local Malaysian families having a break from the city. 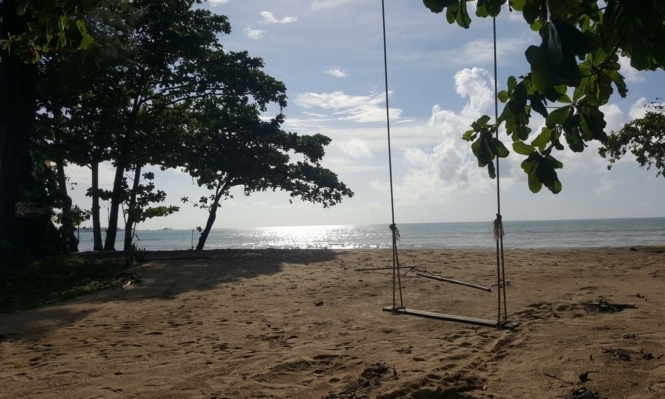 At night time after dinner, the kids can play on the giant rope swing or play volleyball while you watch the sunset. You can read more about Pulau Besar from Smiths Holiday Road. Cherating Beach is a little known outside of Malaysia, but it’s a beautiful beach found on the east coast. It’s a quiet fishing village which gets enough tourism that backpackers and more luxury travelers are well catered to, with some hotels and small guest houses lining the main road. The beach is nice and wide and surrounded by jungle. In addition to its many water activities, you can also visit a turtle sanctuary. There are also popular river cruises to see fireflies at night. There are small coves along the coast from the main Cherating Beach, which you may even get to yourself. 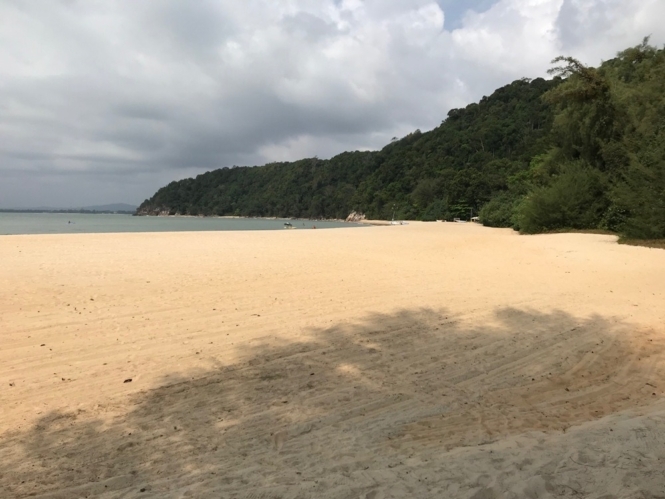 If you are looking for a great beach that’s easy to get to and has creature comforts without being busy and popular then Cherating Beach is a great place to head. You can get to Cherating Beach by bus from Kuantan, Kuala Terrengganu, Kota Bharu or Kuala Lumpur. You can read more about Cherating Beach from Simpler and Smarter. If you’re looking for an unspoiled and peaceful stretch of sand, then Coral Beach on the Cambodian island of Koh Ta Kiev is perfect for you. Situated an hour’s boat ride away from Sihanoukvile’s Otres Beach, you’ll be dropped off on Long Beach and welcomed by a relaxed atmosphere with people swinging in hammocks, snorkeling or enjoying the incredible views. Coral Beach is a beautiful place to wind down and get back to basics. There’s no WiFi and the electricity is limited to generator power in the evenings. We fell in love with the place because there’s no one pestering you to buy things, there are no tourist traps and the ocean is gorgeous for swimming in. We’d highly recommend visiting Coral Beach and staying in one of the rustic bungalows! You won’t regret your time there. You can read more about Coral Beach from Two Tall Travellers. 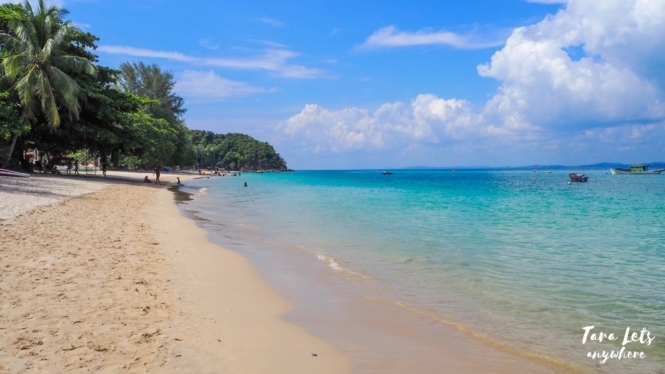 Sihanoukville is a perfect area to hit the beaches but it’s really anything but quiet. If you are looking for a little less trap music and prefer to lounge on a beach free of touts, it doesn’t take long to find one down along the coast past Ochheuteal. Take a quiet hour-long walk heading south out of Sihanoukville following the coastline the entire way. This option lets you scout out spots for yourself. Or grab a short 20-minute taxi ride head all the way down to the bottom of the little peninsula to find an almost isolated feeling of quiet beaches. Go past Otres beach and you’ll even find a few bungalows that in exchange for a delicious bite to eat or a cocktail to sip, you can lounge on their private chairs. You’ll find a completely different vibe than the busy and loud Sihanoukville but still be rewarded with fantastic beaches, beautiful views and a quiet lazy beach day. Mui Wo is a small fishing town on Lantau Island of Hong Kong. It wasn’t our first choice where to stay in Hong Kong, but it ended up our only choice. 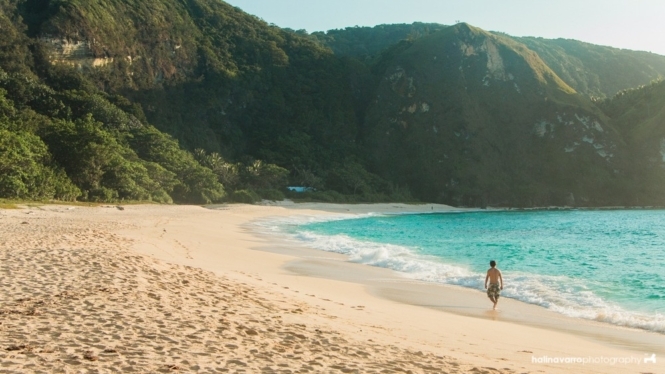 The great thing about this sleepy village is it was home to an incredible and clean beach. Many locals would walk along the sand or have lunch on the wall behind the water, but besides that this beach is quite undiscovered by tourists. The weather was warm and some people did swim right out in the water, but we stayed on the shore. The water was clean and calm and really great for kids to play in safely too. It is easy to find once you get off the boat from the main parts of Hong Kong, just follow the shore line until you hit the sand. From Meldrums on the Move. Have you been to any of these? 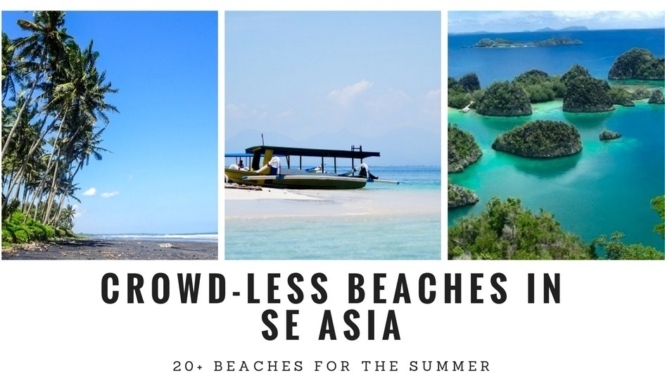 What other quiet/under-the-radar beaches in Southeast Asia would you recommend for people who want to escape the crowd?